Mr. Little notes in the article that the first hamburger will cost €250,000 to create, with a year spent constructing it. The actual process, as lampooned in the Colbert skit, is highly involved and demanding. This doesn’t exactly scream viability. It also begs the question of whether this isn’t a little hypocritical; at once we are asking people to not eat CAFO meat because the process, aside from being harsh on animals, has been taken over by pharmaceuticals in order to mass produce livestock, while at the same time we encouraging a very expensive, highly cultured process to replace the meat we eat. Perhaps the true solution will never be a meat alternative, however much it might alleviate CAFO consumption. As philosopher Dr. Sparrow states in the feature, “This idea is a fantasy promoted by scientists who neglect the social and emotional meaning of food. . . We need to look at restoring local diversity in food production and adapting more ecologically well-founded methods of farming.” Or to put it another way, teach a man to farm, and he’ll eat for a year; give a man a laboratory hamburger, and he’ll sink another couple thousand dollars into the next one. 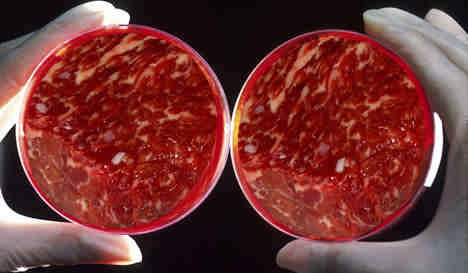 I support lab grown meat without any reservation. There will always be people eating animals. Now, they can eat lab grown meat and spare countless animals suffering, earth degradation. I am happy I do not eat meat!